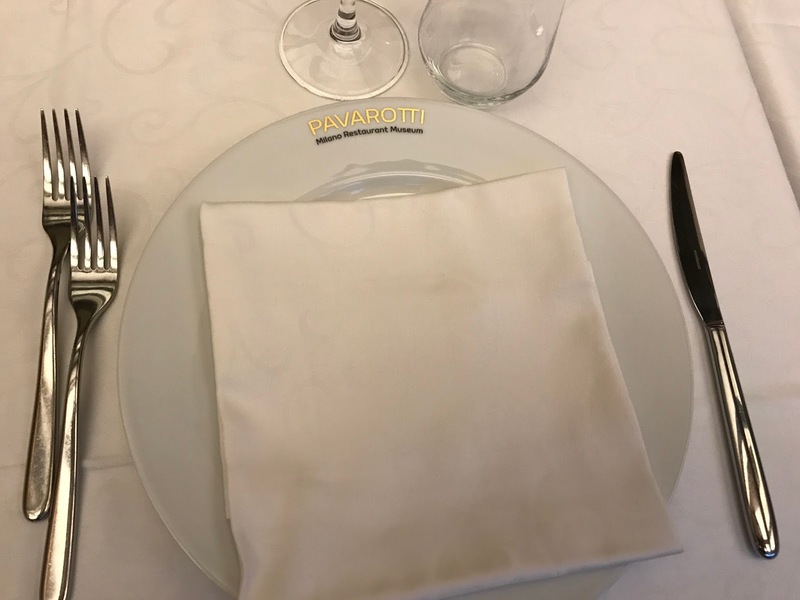 I was in Milan for a 2-day meeting with our European team and at the end of our first day, we all gathered for a dinner arranged by our Milan-based team member at the Pavarotti Museum Restaurant. I hadn’t even known such a place existed. But the first view that struck me when we alighted from the taxi was the impressive structure of the Duomo di Milano or the Milan Cathedral. My favorite Duomo is in Florence but I was suitably impressed just by the outside of Milan’s Duomo. It was gorgeous. My biggest regret is I hadn’t known about it the day before when I was walking around and could’ve gone to see it as a tourist. Ah well, something for next time. 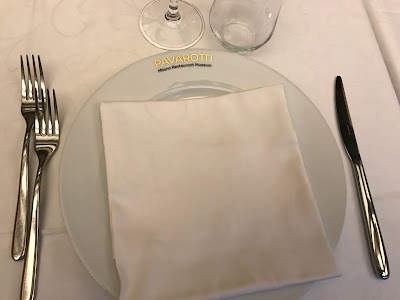 The Pavarotti Museum Restaurant was in the building next to the Duomo, on the 4th floor. You walk in and can do a tour of the rooms that had various paraphernalia and information about Luciano Pavarotti and his musical genius. If you’re a Pavarotti fan, it would be an enjoyable place for dinner combined with a little culture. We were given a separate room for our group so I never really saw if there was a main room for the restaurant or how many people dined there on a given night. But the service was great and the food was delicious. See the music note in the risotto? It was pasta again for me (hello….Italy); this time tagliatelle ragu or long ribbons of pasta in meat sauce. It wasn’t so much a tomato-based meat sauce like a Bolognese nor was it a carbonara sauce but somewhere in between. Whatever it was was again amazingly good. Portion size was perfect and despite it being pasta, which tends to sit heavily, because it was a reasonable portion size, I could savor it and, yes, still have room for dessert. This time around, I had a good idea of what “tentazione al cioccolato” was so I wanted to try something different. “Flan al cioccolato col cuore caldo” looked promising and although the English translation on the menu said it was “chocolate flan warm-hearted”, I bet it wasn’t a flan like I would normally think of a flan as a custard dessert but that this was more like a molten chocolate cake, hence the “warm-hearted” billing. Fortunately, it appears I can speak Italian dessert menu as it turns out I was right. It was a molten chocolate cake served warm in a cool puddle of crème Anglaise. Yeah, it was as good as that sounded. Plus, remember that Italy is the home of my favorite Pernigotti cocoa. I don’t know if that’s what they used in this particular cake but the Italians know how to make good cocoa and good chocolate in general and that was reflected in this cake. Besides the food the and company, I also enjoyed the post-dinner view as we left the restaurant and once again saw the Duomo di Milano, this time lit up against the night sky. Simply gorgeous. We also walked down the nearby gallery with its domed roof and architecture that, ironically, reminded me of the mall of shops at Caesars Palace in Vegas. Just more classy and not tacky.